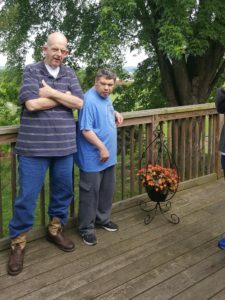 Residential Services | Community Living Inc.
Community Living’s largest and oldest service is residential services – housing provided in group homes. Usually, three people we serve live in each house, and CLI staff are on duty to ensure they have the support they need to live as independently as possible. Residents each have their own bedroom and participate in the maintenance of their home to the best of their ability. Well-trained staff provide assistance as needed with personal care, grocery shopping and cooking, completing medical appointments, housekeeping and everything else to make each person feel at home. CLI strives to match people of similar skills and interests to maximize the potential of everyone in the house. CLI has nursing services to help ensure the health of each resident with an RN completing regular visits and completing nursing assessments. These houses are home to the people we serve, and we respect their privacy and ownership of their space. CLI strives to make each house feel like home in every way possible and we try to ensure every person has the opportunity to be a productive and involved member of his/her community.